JibJab has made some hysterical political animations, & this one is no exception. It is about Dubya's predictably disasterous 2nd term, and all the troubles that have been plaguing him as a result of the incompetence & corruption of the Bush Family Evil Empire. w/ the Commander in Cheat's smirk. This video is pretty crazy. 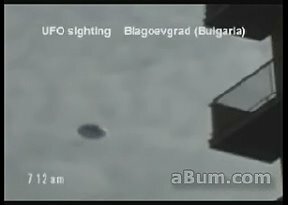 It shows a UFO hovering by a building & zipping away. It looks pretty real, to my discerning eye. 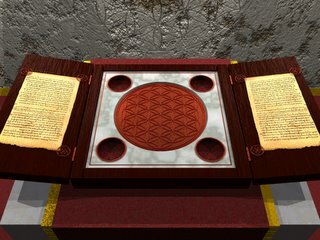 Updated the post with links to various articles about the Da Vinci's Challenge game that can be found online. 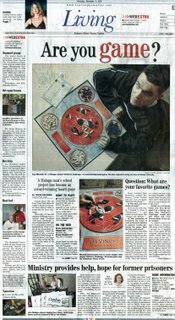 Added the Courier Post article, a article from the Calgary Sun about a 'game night' with Da Vinci's Challenge, and an online review by Tom Vasel that I've seen posted & linked around the web. 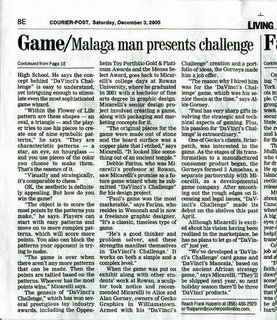 I am posting scans of the article that the South Jersey Courier-Post ran about Da Vinci's Challenge on Saturday, Dec. 3rd 2005. Click here for the Courier-Post online version. The article exceeded my expectations. Reporter Frank Halperin, photographer Chris LaChall, and the editors & staff put together a really cool piece. At first I thought it was going to run in the Sunday paper, but Frank called me on Saturday to tell me it was in that day's edition. My Dad stopped by my house to pick something up right after I got the call, so we both went over to the Wawa down the street to check it out. We saw the banner on the top of the front page, and opened to the Living section to see a my mug & Da Vinci's Challenge taking up the whole front page! I have to admit I gave out a "Wooo-hoo!!!" in the store. It was really important to me to have my Dad there, with a big smile on his face, to see my efforts really starting to pay off. Both of my parents raised me to always do my best, and anything that I ever accomplish in my life is to their credit. The depth of the article was great, also covering my employers/partners Alan & Alice Gorney, our company 3 Amoebas, the toy company Briarpatch, and the creation of Da Vinci's Challenge at Rowan University. 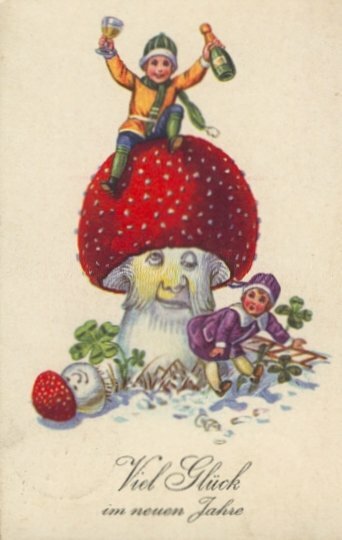 Click on an image for a larger scan. 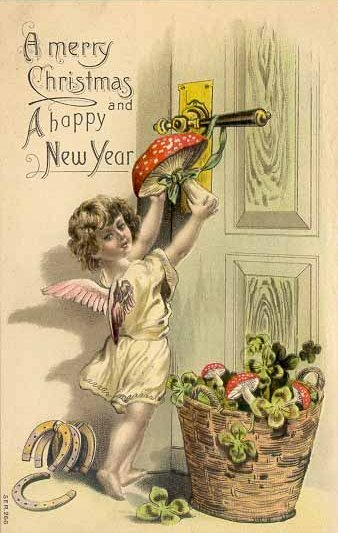 Relinked to this post for the benefit of anyone who is visiting my blog as a result of the article that will be in the Courier-Post paper and website this Sunday, Dec. 4th. 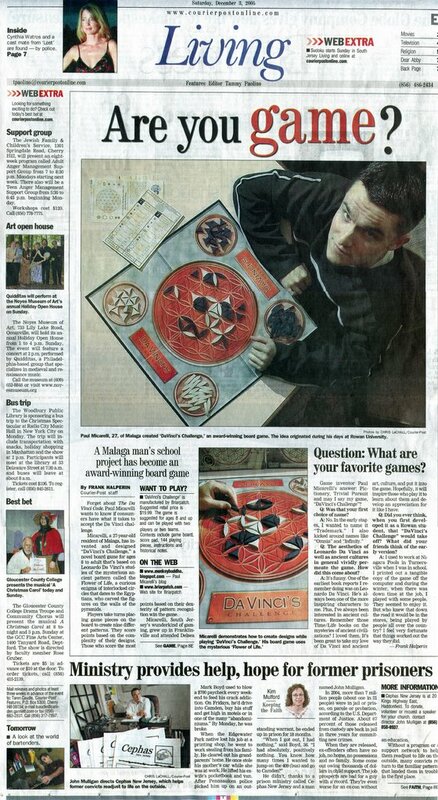 "Secrets of Da Vinci's Challenge"
that I created as senior design student at Rowan University. 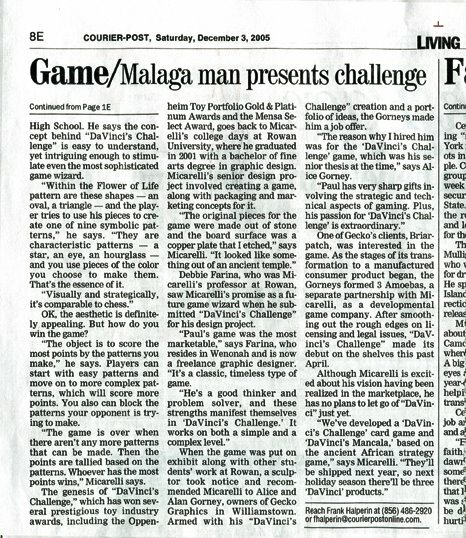 Da Vinci's Challenge was shown with other 'Party Games' in the Target weekly circular ad for 11/26/05. 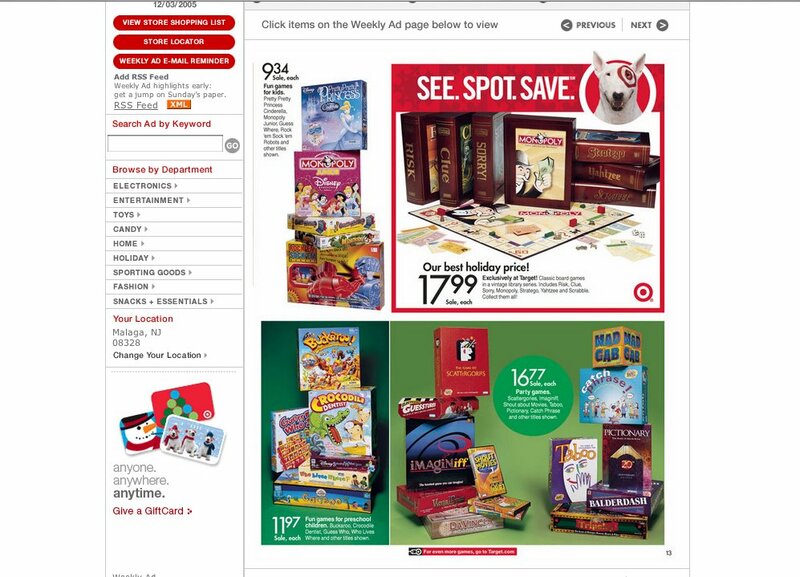 Since looking through the Sunday circular ads to see what's new or on sale has been a weekly ritual in my parents' house growing up, it's cool to see my creation in there. Here is an image of the page, click on the picture to expand it. Da Vinci's Challenge is in the bottom right photo of games - it's at the bottom of the stack.